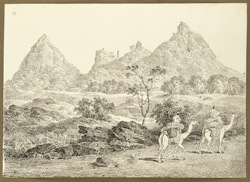 Pen and ink drawing by Sir Charles D'Oyly (1781-1845), of rocky hills at Raghunathpur in West Bengal, dated 4th February 1823, from an album of 80 drawings of views in Bengal and Bihar taken between January 1823 and May 1825. D'Oyly remarked that bears, living in caves in the dark grey granite hills, often raided the village of Raghunathpur situated below them. A telegraph tower was located on top of one of the hills. This image is from the largest group of drawings in the album which consists of sketches made between 26 January and 27 February 1823 during a journey from Calcutta to Gaya (Bihar) along the 'New Military Road'. This road passed through Manbhum district (Bihar) to Hazaribagh (Bihar) and through the hills to the N.W. to join the present Grand Trunk Road near Sherghati (Gaya district, Bihar). Begun in 1782, it had semaphore signalling towers built along it in the early years of the 19th century.